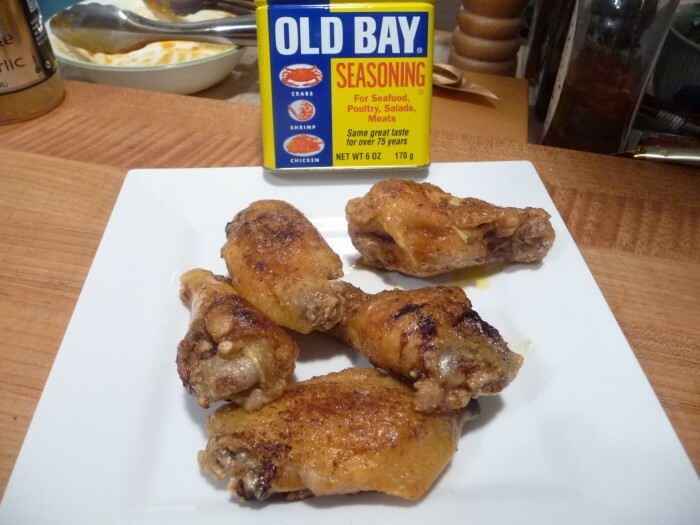 Old Bay Seasoning on Wings is a classic take on our local crab / seafood seasoning on deep fried wings. These deep fried wings get a nice kick from Old Bay and butter. Melt butter in bowl, add Old Bay Seasoning, toss hot fried wings in butter / Old Bay mixture to coat. These wings are silky, crispy, buttery, savory and delicious. They are unique and delicious wings that everyone at your party will devour! – Marilyn rates these at 5 stars. Enjoy. We baked the wings for 40 minutes with a light dusting of Old Bay, then deep fried them til crispy. Tossed in the butter and Old Bay mix, the flavor and texture were perfect – still crispy, buttery, and Old Bay-ey :-). You could finish them off with a light sprinkle of Old Bay when you’re done, but they really don’t need it, especially if you’re sensitive to too much salt like I am. Pretty much! Just go easy on the butter part. Such an easy preparation but dang good. Who knew Old Bay was so good on wings? I found out by accident. Old Bay is such a classic spice blend, it’s good on so many foods! But I do miss the days when it was only available in the Maryland / Chesapeake Bay region. Back then, I could brag about it to those west of the Allegheny Mountains!